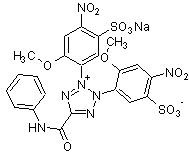 Tetrazolium sodium salt for use in colorimetric assays for cell viability and proliferation. Cleavage of XTT by dehydrogenase enzymes of metabolically active cells yields a highly colored, water soluble formazan product, an advantage over the use of MTT due to MTT requiring a formazan crystal solubilization step. Has been used to asses valvular injury for testing cryopreserved cardiac valves. Publishing research using ab146310? Please let us know so that we can cite the reference in this datasheet. There are currently no Customer reviews or Questions for ab146310.